The third anniversary of the 11 September attacks has been marked by the families of British victims both in the UK and in the US. Three hundred British police officers have taken part in a ceremony at New York's Ground Zero. The officers from 47 forces formed an honour guard for the relatives of the 2,749 who died in the attacks. 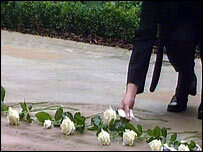 In London, the families of the 67 British victims laid white roses at a memorial garden near the US embassy. The Britons who lost their lives in the collapse of the Twin Towers were also remembered at a service at Hanover Square in New York, near Ground Zero, where a permanent memorial garden for the British victims of 11 September is still under construction. The ceremony was attended by 67 British police officers representing each of the victims. But some relatives were finding it difficult to cope with the grief caused by the memorials. Charles Wolfe, 50, who moved to New York in 1979 and lost his wife Katherine who was working inside Tower One on 11 September, said: "I'm ready for the big ceremonies to stop, it is bringing up grief unnecessarily." "It stops you from moving forward and takes you right back to the day. "Today I've seen parents wailing with grief as if it had happened yesterday. I do not think we need this anymore." Meanwhile, politicians took the cue from the memorials to underscore once again that the war on terror, sparked by the 11 September attacks, was not a battle of the West against Islam. "Our fight against terrorism is not a clash of civilisations or religions," Foreign Secretary Jack Straw wrote in an article published in the London-based Arabic newspaper Al-Sharq Al-Awsat, which has a wide readership in the Arab world. "It is a clash between civilised values which we all share and desire - mutual respect, compassion, the celebration of human life - and the terrorists' agenda of violence, hatred and destruction." He then quoted an al-Qaeda spokesman who claimed responsibility for the Madrid attacks of March as saying: "You love life, and we love death". "All of us who love life - of whatever faith, religion or nationality - need to fight the terrorist threat together," Mr Straw wrote. 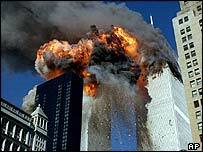 "Since September 11 2001, we have." Also on Saturday, a memorial to mark the third anniversary of the attacks was unveiled at a US airbase in Suffolk. The pentagon-shaped garden at RAF Mildenhall has two trees in the middle - a memento of the Twin Towers. In London's Grosvenor Square, in front of the US embassy, people laid white roses at the memorial garden, repeating a gesture started at the first commemoration in Westminster Abbey. Alexis Clarke, chairwoman of the UK 9/11 families support group - who lost her 30-year-old daughter Suria in the attacks on the World Trade Center - said the families would spend the day in a variety of ways, remembering their dead. "The families will come [on Saturday] bring their flowers and be by themselves privately in the garden. "Some families have gone to New York, some wish to stay at home and be completely quiet, and if they have a grave they will do that." A twisted metal girder recovered from the Twin Towers is buried beneath the garden, which she said was a "very special place" as it gave a focus for grieving, especially for those who had no grave to visit. 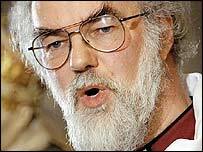 A wider view was urged by some British Muslims, who said "violence and discrimination" was the legacy of 11 September. Islamic Human Rights Commission chairman Massoud Shadjareh said: "At this time of reflection, it is important to see the whole picture and look at the devastating results of not only the events of 9/11 but various governments' responses. "The backlash against Muslims in the UK needs systematic and sustained responses from the British Government, yet instead we see endless attention given to increasing draconian legislative measures which are used almost overwhelmingly against Muslims." "They have come here from all over America and beyond"
Is the world less secure?